After our latest weekend shopping haul (video below), we went back to a different store a couple days later to take advantage of a beef brisket special. If you are willing to buy in bulk, you can score some great deals! We picked up more chuck roast while on sale as that is probably our favorite, and an 18# brisket. We have found the fatty cuts of meat to be ideal blend of protein + fat. Most of us are still paralyzed around the notion that saturated fat, red meats, pork, and especially fattier cuts of meat can be considered healthy food. Rather than grabbing nuts and an apple for a snack like I used to, I opt for a piece of summer sausage or ham. Lately, I don't even seem to need to snack. I've been starting out with a higher fat but light first meal ~ which just today consisted of bone broth with a little salted Kerrygold butter, then a bit later, 2 pieces of bacon, followed by a delicious latte while out with a friend, made with half and half. Despite running three sprints, and spending another hour doing some mobility training and calisthenics, I still have yet to feel the need for more food. It's now 2:20, and I have some of the delicious and tender beef brisket coming up to room temp, while the broth heats up, preparing to finally eat one good meal of a fatty meat. My mind is still finding this all pretty amazing. The salads and fruit and nuts I used to eat not only no longer appeal ~ well some fresh berries and sour cream or whole fat yogurt is always refreshing ~ but they simply did not provide me with the focused energy, nor the improved health that I expected while eating all those 'anti-oxidant-rich' whole plant foods. Neither did I ever resolve my regularly irregular issues with elimination. Lettuce is mostly water and fiber with some nutrients. It provides bulk, but not a high amount of nutritional bang for the many many bites. While I will continue to enjoy some low-carbohydrate fruits like cucumbers and tomatoes and a little lettuce or well cooked or naturally fermented cabbage, and a little local citrus, or seasonal berries, I have realized in my mind that it is best for me to fill up on the nutrient-dense meat and fat first. Plant foods don't offer what the hormones in the brain are looking for of the essential fatty acids and amino acids, nor the satiety of animal protein and fat, which can easily lead to overconsumption of those foods. If I over consume plant foods, I tend to feel it in my gut. The lower belly bloating returns. And I feel full, without feeling 'full' ~ as in not fully satiated. Deficiencies add up over time. Our mind is often our biggest detractor from being on board with what is actually best as the ongoing marketing of plant-based diets is everywhere, and gets into our psyche. We now collectively tend to think green = healthy. Green drinks, green smoothies, and all those expensive drinks (coconut water, kombucha, pressed juices, etc.) are seen as healthy. What sounds good on paper (and in marketing ads) is not necessarily what is actually ideal. The green drinks 'sound good/nutritious' but they are really not delivering the ideal nutrition that we think. They just don't compare to the energy producing and health restorative capabilities of animal flesh foods and fats. Even when people decide to try a ketogenic diet, they tend to still focus on a lot of plant fats ~ nuts, nut butters, olive oil, coconut oil, and avocados. While these foods are not completely bad, they are not the best foods to craft your diet around. Making all kinds of alternative 'low-carb' bars, cookies and pizzas from plant fats will not net the same health results in the end. Nuts are high in Omega 6 fatty acids, which can lead to increased levels of inflammation. They also contain anti-nutrients that can be potentially destructive to your gut without realizing it. To know for sure, it's best to eliminate all those foods for at least one month, then see how you feel when adding them back. I know I'm a food heretic, but fatty meats rule. Eat what you can budget of fattier cuts of meats. When you give this a chance, and really scale down on the plant foods, you will most likely experience better health, along with potential weight loss, improvement in athletic results, better skin, and much more. Meat, especially red meat is super nutrient dense! I discuss the symptoms that may be experienced in the first few months of making a transition to a low-carb, hypercarnivore diet, and what to do about them in The Trust Your True Nature Low-Carb Lifestyle. All I am saying, is give meat a chance! To make it easier, here are a couple simple recipes for making a roast, or beef brisket. Place meat in a baking dish or roasting pan. Drizzle some vinegar on the meat. I usually put my index finger on the opening, and just shake a few times. You aren't saturating the meat, just putting a little on to help tenderize. Season with a generous amount of all the spices, and rub in. This can all be done ahead of time, and left uncovered in the refrigerator overnight. When ready I brush a little tallow on top of the meat with a pastry brush. Place in oven for about 15 minutes at 450º, then turn to about 225-250º. Roast for about 2-3 hours, until the internal temperature at least 130º for rare, or higher if you prefer it more cooked. At the low temp, it remains pink inside, despite the long cooking time. This is even better the next day! It comes out super tender, especially if you let the chuck roast sit for one hour to overnight. You can see this being prepared on the above video. Rub spice rub all over the brisket. Place in a Dutch oven or baking dish that has a tight fitting lid, or a baking dish you can cover with foil. The meat can be placed in the fridge overnight, similar to the Chuck Roast. Leave it uncovered. Heat oven to 350º when ready to roast. Place brisket in uncovered for one hour. Add enough broth or broth plus water to fill about one inch up the pot. I used bone broth made with a mix of poultry bones and a few steak bones, plus some water, and the 'broth' from a jar of homemade fermented beets, as that is what we had on hand. It came out great! Cover, then turn to 300º, and let it roast for three more hours. Do a check with a meat thermometer. It should be ~ 140º. Higher is fine. It won't really be pink inside like the Chuck Roast. 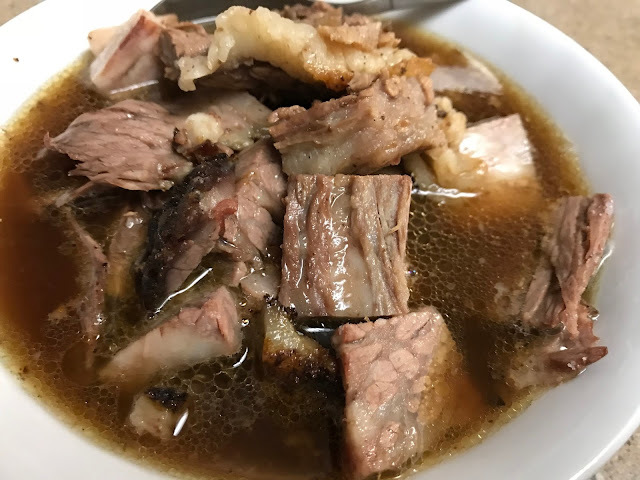 Beef Brisket w/ Chuck Roast. These meats are typically even better the next day. Save the broth, and heat it up. Place measured amount of cut up leftover roast or brisket in a bowl. Heat the leftover broth, then pour on top. Meal ready in minutes. This is a hypercarnivore meal plan, so plants are optional. enjoy your meat and broth as is, or have with plants. Enjoy plant foods like condiments. A VIDEO RECIPE FOR THE BEEF BRISKET IS ALSO IN THE VIDEO BELOW. When eating fattier cuts of meat, you may find yourself eating less total calories, and easily losing excess fat, while gaining more lean muscle, especially if you are doing some type of physical training. To help improve the gall bladder's ability to digest fat after eating a much lower-fat diet, you can take bitters before a meal, or a digestive enzyme with HCL like this NOW Super Enzyme w/ HCL. Artichoke extract capsules are also good for helping improve fat digestion. If and when you reach your fat limit, you may feel slightly nauseous. It will pass. Afterwards, you may notice feeling slightly elated ~ indicating you are becoming more fat-adapted, during fat rather than glucose for fuel. You will probably remain satisfied for hours after a meal with the right amounts of protein + fat, without craving anything, except perhaps something a little juicy or some water. It can take some time to adjust to a higher meat and fat, hypercarnivore diet. The results are excellent! Give it a try, and be patient! Want some help making the transition to a healthy, low-carb, high-protein, keto-hypercarnivore diet? Take The Hypercarnivore 30-Day Health Challenge!